Hopefully, if you are making plans to move to Mexico you have begun taking steps to start learning the language. Speaking Spanish will put you more in control in a foreign culture. It will open up new worlds for you. Not having it will mean there will be days you stay at home when you otherwise might not. Folks generally plan and prepare for Mexico for a few years before they come. Yet a majority of people decide they will learn Spanish once they get here. When I was a ski instructor, we always started the ski lessons by getting familiar with what types of daily exercise the students did. We could then relate familiar movements of the sport they knew to skiing movements. Deciding to learn Spanish once you get to Mexico is like deciding to get into shape for a mountain bike trip to Moab, Utah once you are in Moab. Sounds kind of silly in those terms, doesn’t it? Yet that’s what most of the expat population does. They think that some type of miraculous osmosis will occur once they live here, that they will just absorb the language out of the Mexican air. Then, like that mountain bike rider, they arrive (so excited!) to their destination and get so beat up, discouraged and embarrassed that they retreat into the expat bubble, nice and safe until an incident drives them back to Duolingo for a few weeks to begin the cycle all over again. Or they depend on their Spanish-speaking partner (a rather vulnerable position). If you take some type of athletic trip, you know that you will have a much better experience if you get into some kind of shape a year before, maybe even train especially hard for a few months before you leave. You will enjoy the trip more and keep up better with your mates. Having a head start on Spanish when you move to Mexico is like that. Mexico is the deep end of the pool. If you are learning, you are special. If you are taking the time daily to learn before you go, you are part of a small percentile of the population of potential expats. If you keep your studies up, you will become part of a special group of people. You will discover just how special this group is as you get to know fellow students, especially those who are learning English as a second language (with whom you might be practicing). They will be some of the most passionate, both energized and energizing people you’ve ever met. Learning beyond functional Spanish takes time and patience. You will have to persistently seek out language partners as motivated as you. You will have to study grammar and memorize a lot of vocabulary. You have to endure criticism (“Kerry, you really should be using the subjunctive more at your level.”). Any worthwhile goal requires a price be paid. The rewards, just like everything else you’ve ever done that was hard, are profound. There is one thing you need to expect as you travel on this journey of brain-twisting verb conjugation and feminine vs masculine indefinite articles: the envy of expats who haven’t taken the time to learn. Envy: “feeling of mortification and ill-will occasioned by the contemplation of superior advantages possessed by another,”- Oxford English Dictionary. Envy is always a social comparison or social competition. In his studies on the emotion. Richard Smith, a psychologist who studied envy, defined envy as requiring two conditions. The first is relevance, the advantage must be personally meaningful to the person who envies. The second is similarity. The envied person must be similar to us. Most expats live in Mexico because they love Mexico. Almost all of them would love to have at least a few native friends and partake in the culture. What most often happens is that once language learning gets uncomfortable, people retreat. The actual speaking is more nerve-racking than many anticipate (It’s pretty nerve-racking when you want to express your admiration for a Mexican home’s neo-Gothic architecture and you're stuck with “Su casa es bonita.”). There are three responses to envy. You can defer to the object of your envy, seek to eliminate them (in this case by avoiding their company) or attempt to possess the same quality of the object of your envy. When I’m in the States and run into a Mexican or native Spanish speaker, I get really excited about practicing my Spanish with them. Having sacrificed and suffered, when you achieve a decent conversational level of Spanish as an adult learner, you won’t want to hide it. But often you will need to. You will need to make friends with fellow expats regardless of your and their level of Spanish. If you do speak Spanish or are learning, the best way to avoid possible resentment is to not volunteer that you speak Spanish. Find out if they are seriously learning before you share your enthusiasm or whip your mastery out on the street. Psychologist Vieles Niles van de ven, in studying the emotion, discovered that some languages have two words for envy, one for benign envy and one for malicious envy. Benign envy plays out as admiration. Benign envy can drive us to do better. Resentment that surfaces from malicious envy is difficult to get rid of once it’s planted itself. It can poison a potentially good relationship. Malicious envy masks itself with behaviors like exclusion and unjustified criticism (Those times you are under attack and find yourself asking, “Where is that coming from?”). An expat friend, a sociologist and one-time Ph.D. candidate who would particularly enjoy the cultural insights of having Mexican friends, once shared how terrible it felt to attend a Mexican wedding and not be able to talk to anyone, “It feels terrible to be shut out, ” she said. She’s lived in Mexico eight years. Fear of missing out can be a subtle signal of envy (according to psychologists). When you share your efforts to learn the language, once in awhile you will bear the burden of envy from otherwise very nice people. Do not share your social experiences (the posada you attended, the mariachi dancing until 2 am you did) with those who have not told you about having similar experiences. Do not tell them about the tingling evenings you have spent in remote locations with people who don’t speak a word of English and what an awesome a time you had. If you are a person willing to do the work, there’s little you can do for those who won’t. Don’t lecture them. Don’t give them advice on the tools that have worked for you. Don’t attempt to inspire them by sharing how it has changed your life in Mexico. If living in a foreign country isn’t in itself enough to motivate someone to learn the language, nothing you say will convince them either. Emotions have evolved to help us. Even negative emotions can be channeled for positive results. When you meet people who speak the language better than you, use any envy you feel to motivate you to sit down and spend that extra half hour studying. Soak up what you hear from native speakers. Get excited. Lean in. Use your envy to reach new heights. Consistency is key to learning anything. You cannot improve without it. If you study and practice every day, you will improve. I promise. Don’t listen to anything the less disciplined say that may dissuade you from achieving total linguistic freedom in Mexico. Coming Up: Your complete guide to using the Cross-Border Express in San Diego to gain access to cheaper flights on Mexican carriers. Most recent: The spirit of Mexico radiates from the art and artists of Oaxaca. Kerry Baker is the author of two books. 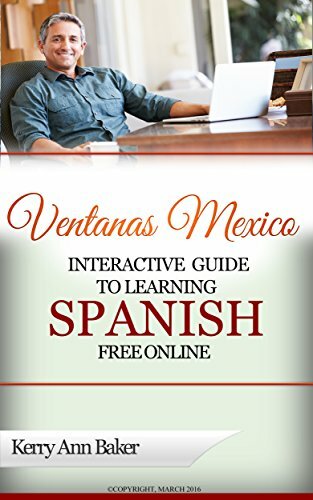 The first is "The Interactive Guide to Learning Spanish Free Online," a curation of the best language tools on the web, organized into lesson plans, or put together your own unique lesson plan every day. Don't let boredom and the same tools every day prevent your forward movement. Use the guide! 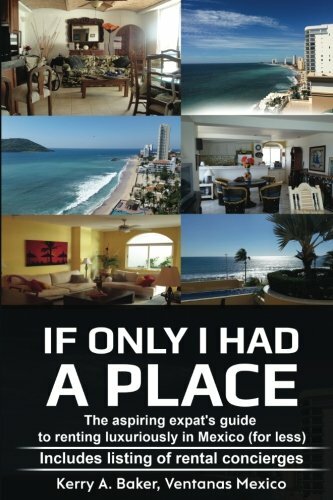 The second book is "If Only I Had a Place," a guide to renting luxuriously in Mexico that includes a listing of rental concierges that can help you preview any place your considering before signing on the dotted line. Rent luxuriously for less and create the foundation for the richest possible expat life.